The global antithrombin market features a consolidated vendor landscape with the presence of a handful of established players that are scattered in regional and global markets. The market is also characterized by stiff competition with the dominance of a few players that occupy leading revenue base. With the entry of new players in this market, which has ample growth prospects, the competition is likely to heat up. The global antithrombin market is primarily driven by the widespread use of antithrombin for the treatment of several medical conditions such as hereditary antithrombin deficiency, extracorporeal membrane oxygenation (ECMO), disseminated intravascular coagulation (DIC), and sepsis. The increasing use of antithrombin as a combination therapy with heparin is likely to open immense growth opportunities for this market. As per a report by Transparency Market Research, the global antithrombin market is likely to clock a CAGR of 5.2% for the forecast period between 2017 and 2025. At this pace, the worldwide market for antithrombin is anticipated to attract a revenue of US$704.5 mn by the end of 2025 from its worth of US$448.2 mn in 2016. The report on the global antithrombin market has been assessed on the basis of four categories: application, source, dosage form, and geography. The key application segments of this market are therapeutics, research, and diagnostics. The therapeutics segment stood as the leading contributor holding almost 94.4% of the market in 2016. This is attributed to the therapeutic efficacy of antithrombin for several diseases, and thus have led to the availability of therapeutic antithrombin preparations with approved indication. On the other hand, research based application is gaining traction with rising initiatives of in vitro study and to discover new disease indications. Based on source, human, goat milk, and others are the segments into which the global antithrombin market is divided in this report. The human segment served the demand to attract a revenue that constituted 88.6% of the overall market in 2016. While the goat milk segment held 7.0% of the market in 2016, the segment is expected to gain market share to account for 9.8% of the overall market by 2025. Goat milk derived antithrombin are currently available in North America and Europe. However, the availability of these products in Asia Pacific and Rest of the World is expected to boost the share of goat milk source segment during the forecast period. Depending upon dosage form, the global antithrombin market is bifurcated into lyophilized and liquid. Of them, the lyophilized dosage led the market in 2016. The segment attracted a revenue that constituted almost 95.8% of the market in 2016. This is mainly because majority of therapeutic antithrombin products are available in lyophilized dosage form. On the other hand, the liquid dosage form segment held over 4.2% market share in 2016. Limited use of liquid antithrombin preparations in research and development activities accounts for the low market share of liquid dosage form segment. Geographically, the report has been segmented into five regions: North America, Asia Pacific, Europe, Latin America, and the Rest of the World. Powered by the U.K. and Germany, Europe held the commanding position in 2016 holding more than 38% of the overall market. The growth of this region is attributed to significant adoption of antithrombin therapies on the back of high awareness, early availability of advanced technologies, significant increment in national healthcare budgets, and extensive research initiatives. North America stood as the second-leading market for antithrombin in 2016 accounting for almost 21.2% market share. However, Asia Pacific is expected to display the leading growth rate of 6.3% for the forecast period of 2017 to 2025. Leading players in the global antithrombin market include rEVO Biologics Inc., Grifols, Shire plc., CSL Limited, Kedrion S.p.A., Lee Biosolutions, and Scripps Laboratories Inc. This report on antithrombin market studies the current as well as future prospects of the market globally. The stakeholders of this report include companies and intermediaries engaged in the manufacture, commercialization, providing services of antithrombin products such as Antithrombin III, ATryn, and Antithrombin Gama and others as well as new entrants planning to enter this market. This report comprises an elaborate executive summary along with a market snapshot providing overall information of various segments and sub-segments considered in the scope of the study. This section also provides the overall information and data analysis of the global antithrombin market with respect to the leading market segments based on major application segment, source segment, and dosage form segment. Based on the application type, the antithrombin market has been segmented into: therapeutics, research and diagnostics. Each of the market segments have been extensively analyzed based on the market related factors such as increasing demand of antithrombin products worldwide, and technological advancement. Moreover, historical year-on-year growth have been taken into consideration while estimating the market size. The market size and forecast in terms of US$ million for each segment has been provided for the period from 2015 to 2025. The report also provides the compound annual growth rate (CAGR %) for each market segment for the forecast period from 2017 to 2025, considering 2016 as the base year. Geographically, antithrombin market has been segmented into five major regions: North America, Europe, Asia Pacific, Latin America, and Rest of World. The market size and forecast for each of these regions has been provided for the period from 2015 to 2025, along with their respective CAGRs for the forecast period from 2017 to 2025, considering 2016 as the base year. The report also provides with market size and forecast for major countries in the respective regions. A detailed qualitative analysis of factors responsible for driving and restraining the market growth and future opportunities has been provided in the market overview section. This section of the report also provides with market attractiveness analysis, Porter’s five forces analysis, and market share analysis by key players, thus presenting a thorough analysis of the overall competitive scenario in the global antithrombin market. 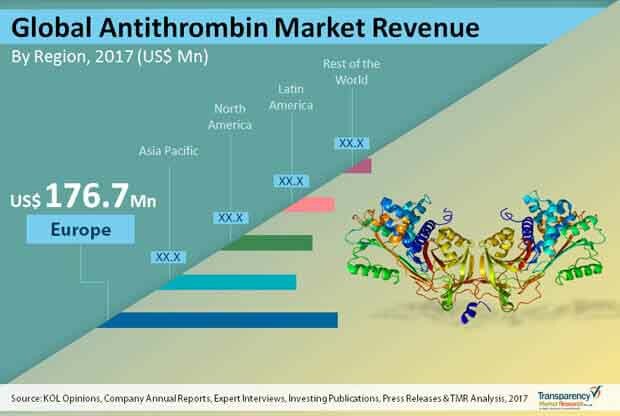 The market overview section of the report explores the market dynamics such as drivers, restraints, and opportunities that currently have a strong impact on the antithrombin market and could influence the market in the near future. Market attractiveness analysis has been provided in the market overview section in order to explain the intensity of competition in the market across different geographies. The competitive scenario among different market players is evaluated through market share analysis in the competitive landscape section of the report. All these factors would help market players to take strategic decisions in order to strengthen their positions and expand their shares in the global antithrombin market. The key findings section included in the report would assist existing market players in expanding their market shares, and new companies in establishing their presence in the global antithrombin market. The report also profiles key players operating in the antithrombin market which are rEVO Biologics, Inc., Grifols, Shire plc, CSL Limited, Kedrion S.p.A, Lee Bisolutions, Inc., Scripps Laboratories, Inc., Octapharma AG, Dem ilac Inc. and Diapharma Group, Inc.